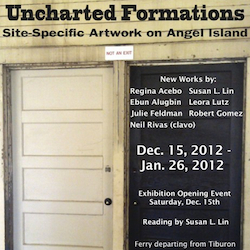 Throughout 2012, We Players’ explored themes found throughout the history of Angel Island, namely journeying, war, homecoming and refuge, and presented a series of art, education and community engagement programs to stimulate discussion around these themes. This graduate class marks an unprecedented collaboration between We Players (an arts non-proﬁt), California College for the Arts (a for-proﬁt institute for higher education), and a California State Parks site. The class explored “island-ness” in relation to historical narratives, works of fiction, current politics, and contemporary artworks. Angel Island served both as a physical and a theoretical site of investigation for the seminar. Additionally, seminar discussions engaged a range of island discourses through readings, screenings, and presentations by community members and guest artists. Students were granted unique access to Angel Island for conducting their own research and site investigations. The class culminated in a closing exhibition comprised of student projects that respond directly to Angel Island as a historical site, and/or to “islandness” as a concept with multiple trends through culture, literature, art, and history.